Apple removes ‘I Am Rich’ : Too much monitoring? I recently published a post about an iPhone application called ‘I Am Rich’ available on the Apple App Store. 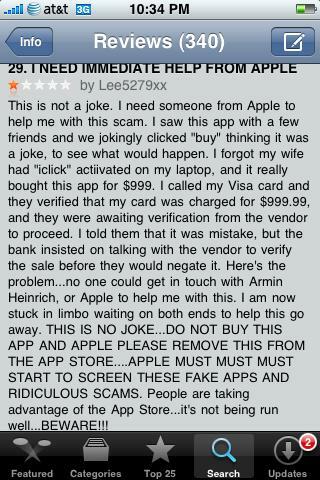 Much to the chagrin of the author of the application, Armin Heinrich, Apple seems to have blacklisted this application. As a result this application is no longer available for sale on App Store. The application in question had a single purpose – to allow people to show off their wealth to others. The last time I checked, showing off one’s wealth does not have any illegality. And this is not the first case to be reported. Even the handy little application called Box Office suffered the same fate. So why is Apple doing this? Did Apple discontinue selling of this application due to the following complaint? As far as the above complaint is concerned, it does not seem to be the fault of the application’s author’s. The complainant accuses the application to be a scam. In what way? The application never promised anything that it did not deliver. Paying $999 for something just to show off you are rich does not seem to be a scam to me. Moreover the purchase was made due to a setup existing in the complainant’s computer. Again nothing to do with the application or its author. More likely, Apple is now trying to flex its muscle and decide which applications a user can buy or use. If I have the money and I want to splurge it on something completely useless, I should have that independence. Why should Apple squelch that? No doubt Apple makes great products but to keep them under so much control is just not palatable. When I purchase an iPhone, there’s nothing written in the purchase agreement that I would have to use only those applications that Apple considers useful or tasteful. So why this policing? The fact that they had allowed the application to be available on their own store shows that there is apparently nothing wrong with it. There are no complaints of copyright infringement or patent violations. Can anyone from Apple clarify their policy with regards to applications allowed to be sold through App Store?